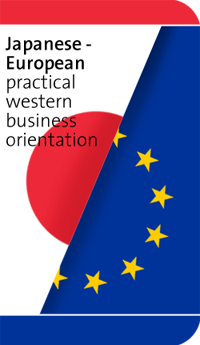 There is an awareness that owner/manager/executives of Small to Medium sized Japanese organisations wish to expand their reach into German and other European markets by establishing import/export routes to and from Europe and also opening affiliate offices within Europe. The programme is designed to combine practical training in aspects of German and other European business practice with real life exposure to German businesses. – Maximise the ability of the delegates to present key messages relating to their businesses confidently and positively in a group setting (one person presenting to several customers). – Maximise the ability of the delegates to use Western sales methods to communicate effectively with European potential customers. – Maximise the ability of the delegates to carry out aspects of negotiation with European potential customers. – Maximise the delegates’ understanding of key differences between European and Japanese culture in areas relevant to business. – Gain an insight into German SMEs by visits and discussions with executives in selected German SMEs. The combination of the skills and experience of the facilitators will provide a unique “bridge” between the delegates’ own Japanese experience and the German or other European markets they wish to enter. The programme will use a wide range of methods, all of which would be appropriate for a European audience. This is deliberate to maximise the delegates’ understanding of the differences between European and Japanese practices. Delegates will be expected to give presentations, run role plays and contribute to negotiation scenarios as individuals and to express their personal and individual opinions in the workshop. All of these would be routine for a Western delegate. There will be practical examples, case examples and direct facilitator input as well as the methods described above. Full workshop notes will be provided. The program will be held in English with partial Japanese translation if necessary. Additionally there will be a module for basic German language training, covering topics such as how to welcome clients and guests, personal introductions and some typical social topics and “door opening” expressions to start a business relationship in Germany. Uniquely, this programme will work with facilitators who have highly relevant but unusual experiences relating to cross-cultural working. Dr. Silvia Dehne, Managing director of NGES, is German and has worked many years for major Japanese companies. She has a knowledge of Japanese market situations and Japanese marketing approaches, speaks the language and has a deep awareness of the differences between German and Japanese culture.